As many of us who live in Bristol have seen first-hand, homelessness is a big problem. Fortunately, charities such as Crisis are dedicated to ending homelessness through their services and campaigning. A great example of this was taking place not too long ago. Every year between the 23rd and the 29th of December, Crisis run their ‘Crisis at Christmas’ campaign. Its purpose stands to provide food, warmth, and multiple services to homeless people over the festive period. Over 10,000 individual volunteers aid the running of this event held in numerous cities including Edinburgh, Newcastle, London, Coventry and Birmingham. Services available include opticians, hairdressers, massage therapists…and a dental service. With time away from BDH for the Christmas holidays, Daniella and myself decided to volunteer a day to contribute to this event. Unfortunately, because we were only partly way through our BDS training we were unable to get involved in the treating of patients. However, Crisis recommended the role of dental receptionist be filled by dental students which we both applied for and successfully gained a place. Rachel and Daniella with the Crisis at Christmas team. We arrived at a South London train station for 8:45am and made the short walk towards a local school. When we got there a huge portion of the building had been set up for the day to be utilised by guests. We were based in a classroom which worked as our waiting room where we greeted patients and helped them complete forms on their medical history, social history and presenting complaint. The 2 dental vans were set up in the playground, with the decontamination room set up in a separate building, 3 floors up. I suspect the view from the window including The Shard and The Gherkin, as well as the lift pass, made up for this distance. Patient’s returned to us in reception to complete their feedback forms after their treatment. The overall response from guests was very positive which was great to see. Before guests left we provided them with oral hygiene advice and a range of dental products. We would like to take this opportunity to thank our fellow dental team volunteers for making us feel welcome. In that one day, we managed to provide 19 guests with dental examinations and treatment and we saw the benefits that had on them for ourselves. 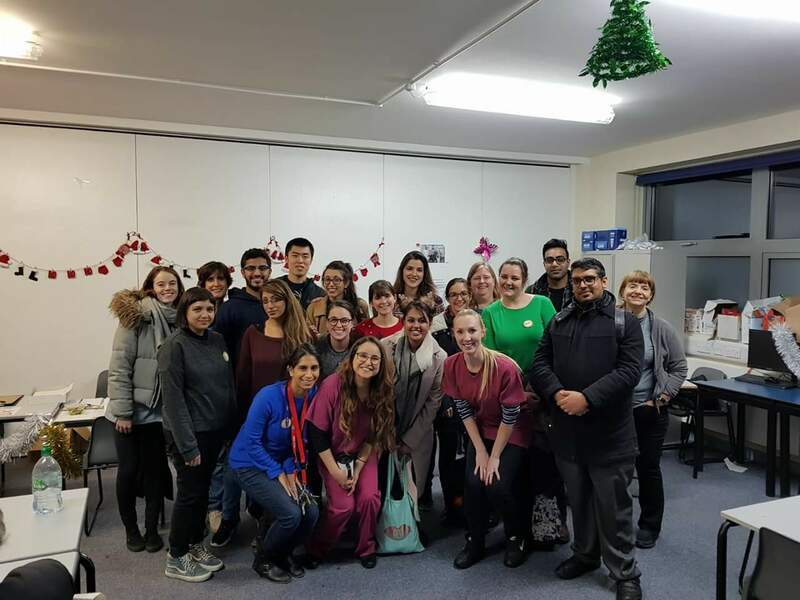 We would recommend volunteering with Crisis to fellow dental students at Bristol, if they are within reasonable distance to Crisis centres mentioned previously during the Christmas period. Registration for Crisis at Christmas 2018 will open in October. ← Previous Previous post: What are dental students’ perception of the social and behavioural sciences? Next → Next post: Dental student to have article published in BDJ!